James Mason has been working on the beacon decoding software to be publicly distributed so that HAM radio operators around the world can decode some of the data they’ve been hearing squawk over their radios from MinXSS. It will also automatically forward us the data (provided the operator has that option enabled with the checkmark). It is all written in python and will be open source under the GPL license, so we hope other CubeSat programs out there will take advantage of it. It has a GUI that uses Qt to make something that looks pretty. It’ll also be a cross-platform executable. 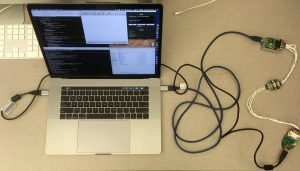 We’ll also probably provide some instructions for how to make a splitter cable so that HAM operators can still use the software they’re familiar with on one USB port and simultaneously run our software on a different USB port. James is hoping to get that released on March 1 but it’s hard to predict with the ample snags and debugging necessary. Right now, the big challenge is figuring out why pyinstaller fails to make a .app that is launchable. The unix executable works fine. There are a lot of issues listed on the GitHub pyinstaller page related to this, and we’re pursuing work arounds. The image of the left is a hodgepodge cable that James connected to his computer to be able to transmit from one USB port and receive on another to test and debug a basic serial reader code that is the first main stepping stone to the beacon decoder GUI.